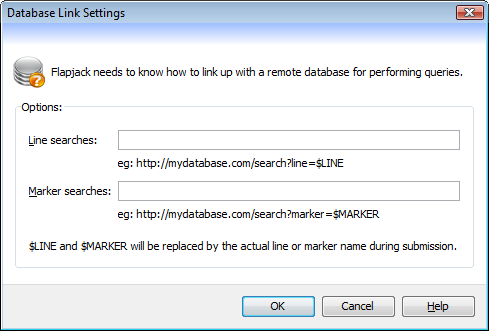 Use the Database Link Settings dialog (Data->query database->Settings) to set or update the URLs that Flapjack will use when attempting to query a remote database for line or marker information. Line searches - enter a valid URL containing a location that can be queried for information on a line, where $LINE will be replaced by the actual name of the line. Marker searches - enter a valid URL containing a location that can be queried for information on a marker, where $MARKER will be replaced by the actual name of the line. Flapjack’s genotype file format supports headers for specifying Database Link Settings. As above, enter a valid URL containing a location that can be queried for information on a line, where $LINE will be replaced by the actual name of the line. As above, enter a valid URL containing a location that can be queried for information on a marker, where $MARKER will be replaced by the actual name of the line.